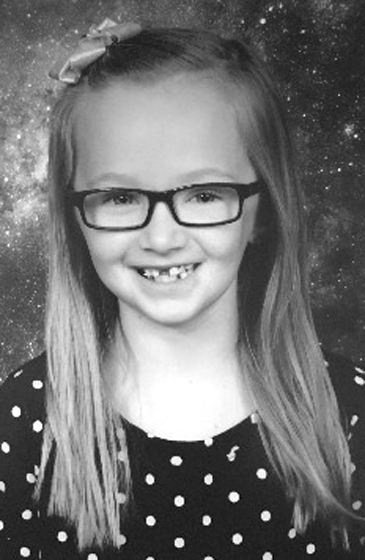 MARQUETTE, MI – On July 22, 2018, Heaven gained an angel as Ainsley Rose Kargela’s life was changed, not ended, passing into eternity and joining her Grandpa Claude. The beginning of her new life occurred Sunday at Children’s Hospital of Michigan, in Detroit, where Ainsley Rose touched the hearts of many doctors, nurses, and patients when she visited, traveling from Marquette to Detroit for weekly chemotherapy treatments. Born June 11, 2010, in Marquette, a daughter of Patricia Williams and Dennis Kargela, Ainsley was raised in the Harvey area and was an exuberant second grader at Cherry Creek Elementary School. Within a year of her birth, a tumor was detected, removed, and everything seemed fine until two years later when she began her long battle with cancer. Throughout the years, Ainsley displayed strength, persistence, and bravery in all her endeavors. Daily she was the sweetest and most caring girl in everyone’s eyes, and she always offered a helping hand. She kept extremely active and participated in Marquette Junior Hockey, soccer, Dawn Dott Dance’s dance team, swimming, and singing. While she tried her hand with different sports and activities, Ainsley made so many friends with everybody she met. Nobody could resist her charm and her ability to make everyone smile. She simply loved being around people and having a good time. She touched many lives and was an inspiration to all. There was a tremendous outpouring of support by both the school and community who rallied together and became known as “Ainsley’s Army”. Ainsley was both powerful and relentless when it came to the monster she had fighting against her. She fought courageously and without hesitation each of the three times she was called into battle in her eight years of life. Ainsley proved in her brief lifetime that a life is defined, not by how one dies, but by how one lives. She gave definition to the term “gift”. Always in our hearts and remembered with love, Ainsley is survived by her parents, Patty and Dennis; brother, Ryder; sisters, Ariel, Karlie and Emma; canine companion, Chauncey; her grandparents, Grammy Gwen Williams, Karen and George Kargela; aunts and uncles, Henry (Tara) Williams, Kathleen (John) Williams, Grace Williams, Charlie Williams, Shelli Kargela, and Kurt (Lydia) Kargela. Ainsley was preceded in death by her grandpa Claude; great-grandma Rose; and great-grandma, Gigi Leskinen. The family will receive relatives and friends at the Swanson-Lundquist Funeral Home on Saturday, July 28, hosting a celebration of Ainsley from 2:00 pm until 8:00 pm. A service of remembrance will be held at Marquette Hope United Methodist Church, 111 E. Ridge Street, on Sunday, July 29th at 11:30 am. A Celebration of Ainsley will be held on Sunday, July 29th at 1:00 pm at the Masonic Center, Marquette. Burial will be private. Donations may also be made to Children’s Hospital of Michigan, 3011 West Grand River Boulevard, Suite 218, Detroit, MI 48202 or by calling (313) 745-5373.